saggio guerrieri vince guerra e prova. II. PURGATORIO XXVI, 71 ff. che for de s6 vostro saver non 1′ archi. c’ al me’ parer li ghaldii an sovralarchi. non con discrezion sembrami marchi. In this sonnet the rhymes are homonymous: marchi is used, in four different senses, for the four even lines of the octave.4 ante paid filial compliment to Guinizelli in the 26th canto of the Purgatorio. The spirit of Guinizelli, as yet unidentified, speaks from the lame, briefly asking the unknown traveler if he be still mortal. ‘ Per morir meglio esperienza imbarche . . . ‘ (11. 71-75). Nel dire e nel guardare avermi caro. In Michelangelo’s fresco of the Last Judgment a man is represented as kneeling and leaning forward just behind St. Peter. The face, dark and aint, appears just to the left of St. Peter’s right thigh; part of the body is visible between St. Peter’s legs ; and the left leg of the kneeling igure appears to the right of St. Peter’s left leg. The face is in profile, the eye looking slightly upward toward the Christ. hree English biographers of Michelangelo mention this figure, and report or express the opinion that the head is a portrait of Dante arford says: In advance of the right-hand group is the Baptist, on the left St. Peter and t. Paul, and between their advancing limbs an animated head peeps out, which is said to be that of Dante. Before quitting this part of the picture, it may be proper to refer to the suggestion that the kneeling figure behind St. Peter has been intended to epresent Dante. The soiled condition of the fresco is too great to enable a distinct examination of the features, of which all that can be have an intelligent, and, so to speak, portrait-like character, antecedent improbability in the suggestion. The poet had already in a post of honour in Raphael’s Parnassus ; the enduring reverence he was held by Michael Angelo is well known, and the gladly indulged his hero-worship by placing the form of Italy’s in a far higher region than that already allotted to him. The attitude, and the earnest attempt to gain an imperfect glance Brightness sufficiently vindicate the painter from any charge and Michael Angelo might rejoice that he had within his testifying his devotion ; for this monument at least he had be refused permission by a worthless master. e engraver Chapon, in .his essay on the fresco, asserts that this figure represents St. Mark : res de saint Pierre, mais au second rang, saint Paul, V apdtre et le docteur des nations. Saint Luc, son e’vange’liste, le suit, tandis que saint Marc se prosterne mblement aux pieds du prince des apdtres.8 Thode lists the many identifications proposed by Chapon, and expresses general disapproval of his method and results.4 Thode himselfr gards the group in which the figure in question appears as a ” Choir of the Apostles,” and in his description refers to this figure as ” eine jugendliche knieende Gestalt hinter Petrus.” He does not, however, suggest a name for it.5 The head is not mentioned in any other study of Michelangelo accessible to me. It is not referred to by Professor Holbrook in his admirable volume on the portraits of Dante;6 nor, so far as I can ascertain, by any other writer on Dante iconography. It seems to me possible, but hardly probable, portrait of Dante. Two Florentine frescoes offered precedent for Dante in such a scene as this : Giotto’s ” Paradise visible in the lifetime of Michelangelo x – and Orcagna’s in Santa Maria Novella. That Michelangelo these two works there can be no reasonable doubt returned to them with special interest during his summer of 1534 : he had already received the commission of his own ” Last Judgment.” Within the Vatican Raphael, in the ” Disputa,” had introduced Dante Michelangelo did indeed hold Dante in ” enduring reverence is attested not only in the two famous offer – to which the last words quoted make a suitable monument for the poet, in case the be allowed to bring back his exiled bones : ” Io Michelagnolo il medesimo a vostra Santita supplicho, offerendomi la sepultura sua chondecente.” Moreover, the ” was influenced by the Divine Comedy – certainly in and Minos, probably in the prominence of Adam the gesture and expression of St. Peter, very possibly There is then abundant reason to expect a representation the ” Last Judgment” The head of the figure kneeling behind St. Peter general character to the traditional Dante as represented sculptors from Orcagna to Raphael: there is the same proportion of the features, the same prominent. The head of the figure kneeling behind St. Peter general character to the traditional Dante as represented sculptors from Orcagna to Raphael: there is the same proportion of the features, the same prominent 1strong chin. The fact that the head is in profile, too, with the pictorial practice: the Dante portraits Filippino Lippi,1 Signorelli, and Raphael are in profile. n the other hand, the face has a more youthful character accompanying plate, at least – than one would look Raphaelite portrait of Dante, and the treatment of the But the plate is none too clear in either of these reproductions give a much more Dantesque impression. range of the painted head itself should settle the matter. Chapon’s assertion that the figure represents St. Mark possible basis than the quite insufficient fact of the figure’s in a humble position, to St. Peter. Thode’s theory that an apostle requires as premise that all the figures represent apostles. But Thode himself remarks the presence women in the group, and it is further to be noted that action of the figure in question differentiate it sharply prominent forms about it. wo other figures in the fresco have been thought to Steinmann2 held that Dante is represented in the figure sleepily from the ground just at the left edge of the fresco. accepted by Spahn, is rejected by Borinski and Thode,ridiculed by Farinelli. Steinmann’s statement that the same Florentine costume and headgear that appear in portraits is quite wrong ; the figure wears graveclothes, as those worn by several of the neighboring figures. Borinski held that the scene within Hell-mouth represents colloquy with Malacoda, as described in Inferno XXI, and that the kneeling leg barely visible just at the lower left corner represents Dante in hiding! This theory, too, receives the ridicule it deserves. I take this opportunity to call attention to a drawing of Dante, in hrist Church Library, attributed by Berenson to the School of Antonio Pollaiuolo. The drawing has not been mentioned, I believe, in any study of the portraits of Dante. It is reproduced as plate XXII in the first volume of Berenson’s The Drawings of the Florentine Painters} It is escribed thus in his catalogue raisonnk : ” Full-length figure of Dante. Pen and bistre. H. 26 cm., w. 9 cm.”;8 and thus in the text : in Christ Church Library at Oxford there is a drawing for a Dante showing an open book. It is a charming but feeble copy of a lost Antonio, and the ffinity with Castagno’s Portraits of Worthies is distinctly felt. 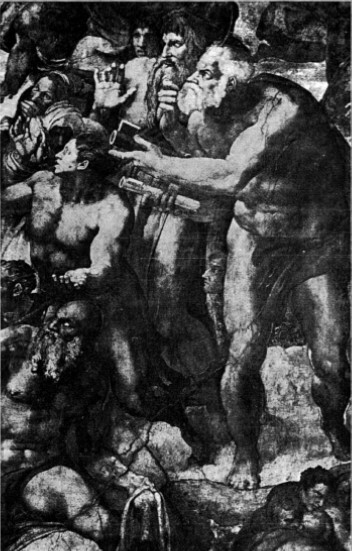 The drawing in the Print Room at Berlin representing the head of a an – probably Dante – with bay leaves in his cap, which is attributed by Krauss 6 to Signorelli, is attributed by Berenson 6 to Piero di Cosimo.